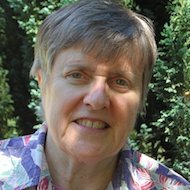 We thank Kathleen Norris for having invited readers to accompany her on a career-long pilgrimage into the imaginative realm where Christianity and literature intersect in graced acts of poetry and prose. To read Kathleen Norris is to contemplate how the mysteries of faith await to be rediscovered in the quotidian world. Whether taking us on a journey to the revelatory bleakness of Dakota, through the festal calendar of The Cloister Walk, into the religious vocabulary of Amazing Grace, or beyond the heartsickness of Acedia and Me, she has demonstrated how immersion in the local, temporal, linguistic, and biographical yields unexpected resources of creativity and beatitude. There is much that could be said about Norris’s exploration of religious language in Amazing Grace: A Vocabulary of Faith (1998); her meditation on heart-sickness and creative inactivity in Acedia & Me (2008); or her biography of the saints, written for children, Holy Twins: Benedict and Scholastica (2001). But if you have not yet had the chance to read Norris, we would recommend that you start with the two works that firmly put her “on the map” for studies of Christianity and literature: Dakota: A Spiritual Geography (1993) and The Cloister Walk (1996). Dakota recognizes the sacredness of place. Inspired by a return to her grandparents’ farm in Lemmon, South Dakota, the book, which was a New York Times bestseller, is grounded in the titular state as a way of exploring the geography of its author’s soul. The bleak and the sublime, the inner and outer, blur and blend into each other, as if territorial boundaries were meaningless for charting a spirit-scape. The Cloister Walk—answering Dakota—recognizes the sacredness of time. Although Norris’s decades in South Dakota rooted her in the Presbyterian tradition of her grandparents, she also became a Benedictine oblate and twice spent extended stays at St. John’s Abbey in Minnesota. In The Cloister Walk, Norris chronicles how her residence with the Benedictines deepened her reckoning of days and seasons as she lived out the liturgy of the hours and the church calendar. A third work, The Virgin of Bennington (2001), is a kind of autobiographical prequel to these two masterpieces, and helps us understand that Norris’s writing is the grace-filled record of an expansive and remarkable journey of faith. We are so grateful to Kathleen Norris for sharing that journey with us. As we follow her poetry and prose, she makes us feel that we trace our own journeys from heart-sickness to a creative abundance.